We were able to purchase difficult-to-obtain parts cheaply. This review is about item#00246635. I chose the spiral somehow because it is cheaper rather than miter gear. However, I was shyly informed that there was R type (right twist) and L type (left twist), and one side can not mesh with each other. 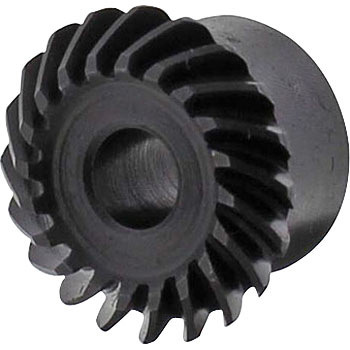 Moreover, as for the product name L type and R type as well, it is not distinguished by 'Spiral bevel gear speed ratio 1: 1', it is not displayed side by side when searching, it is on a separate page, noticing that there are 2 kinds I did not even. It is common sense that bevel gears have R and L, but if it is, then the direction of the product name should be more easily understood absolutely. I waited 5 days to prepare for the mistake, and it took me two weeks to finish it in pairs after all. This review is about item#00246617. Although it is necessary to drill a set screw etc., it was easy because it was not particularly hard material, but there was a little black dyeing unevenness but I felt it was not a level to worry on my level of use.